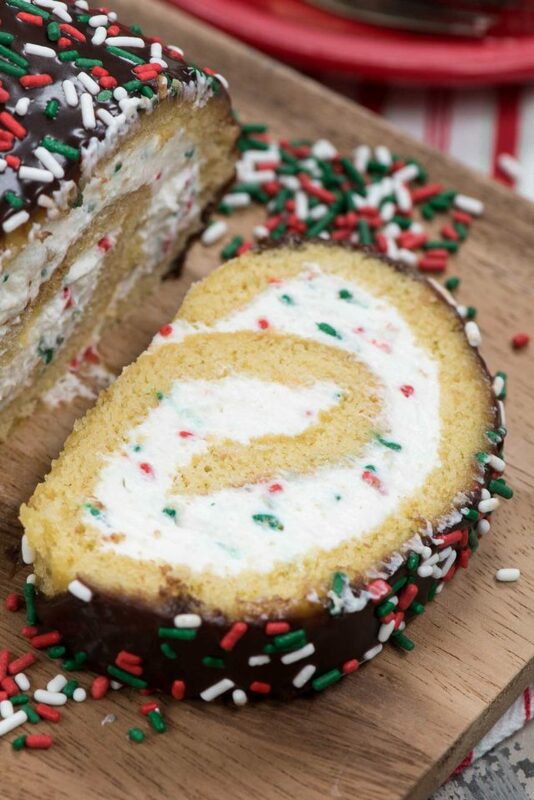 Make this Christmas Cake Roll for the perfect holiday dessert! A yellow cake roll filled with cream cheese whipped cream then topped with chocolate ganache and sprinkles. 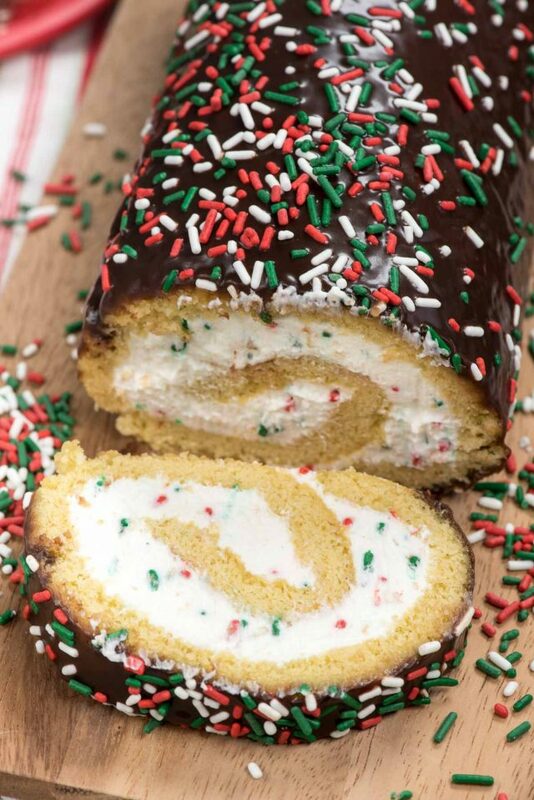 It’s the perfect cake roll recipe for the holidays. People call me the cake roll queen. I don’t know if I deserve that title, but I’m definitely obsessed with cake rolls. This Christmas cake roll is no exception! Every year the 6th grade classes at our local elementary school study a story called The Family Under The Bridge. It’s a story about homelessness and accepting people for who they are, not what they look like or their situation in life. Along with the story, the classes do a sock drive for the homeless and some other things revolving around the story. At the end of the unit, the teacher serves “log cakes” to the class, because the family eats a Yule Log for Christmas in the story. Last year, when Jordan was in her class, the teacher asked if I could make cake rolls for her. She usually would buy them but, knowing my blog, asked. I said yes (and my most popular cake roll to date was born: the Oreo Cake Roll). This year, even though Jordan isn’t at the school anymore, Mrs. B emailed and asked if I minded making cakes for her again. I, of course, said yes. I had the hardest time trying to think of a cake roll recipe to make. 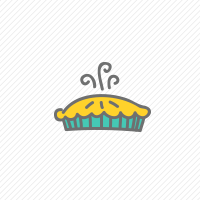 I’ve already made so many flavors, like lemon and mint, apple and so many more. The problem I was having was that I was making these for a bunch of 11 year old kids; they probably didn’t want orange or peppermint or anything I haven’t already done (like birthday cake flavor). Then it finally hit me: go simple. That’s my motto this season, after all. This Christmas Cake Roll is the marriage of three of my favorite cake rolls: vanilla sponge from the birthday cake roll, the cream cheese whipped cream filling from the strawberry shortcake cake roll, and the chocolate ganache topping from the peanut butter cup cake roll. I feel like I’ve made so many cake rolls that I can’t give any more advice about making them. You’re scared it’ll crack, I know. It might, even if you follow my guidelines. Cake rolls are finicky beasts: they crack because you made a mistake in baking or execution but they can also crack because it’s humid, or it’s dry, or it’s Tuesday or the Niners lost. Really, nine times out of ten, your cake rolls will succeed. The tenth time it’ll crack which isn’t that big of a deal because it means you get to frost the outside. Cracks can be hidden with filling and frosting! 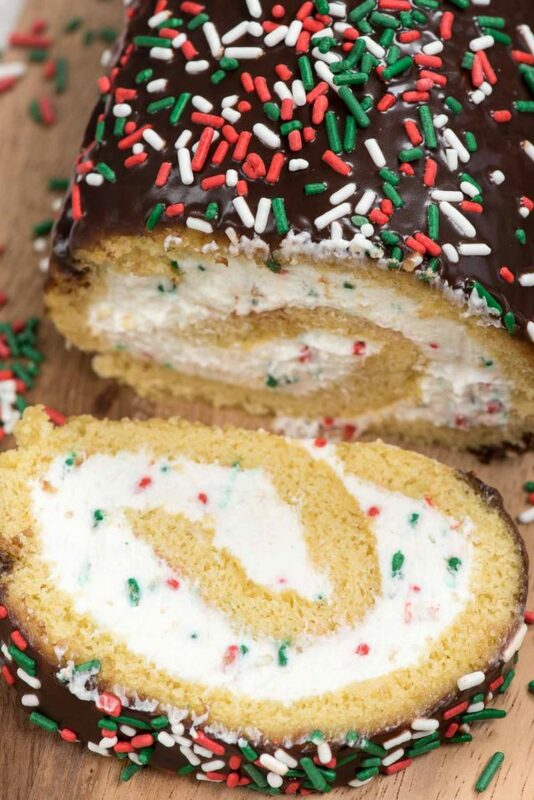 This cake roll is so festive. Red and green is such a fun and happy color combination, and the pop of colors in that filling is magical. By the way, let’s talk about that filling for a sec, mmmkay? It’s cream cheese whipped cream. I could eat it with a spoon! You mixed it too long and made butter. I know, I’m so helpful. Again, like baking a cake roll, the filling has a sweet spot. The whipped cream should stand up on it’s own when it’s done. I often stop the mixer halfway through and scrape down the bowl, just to make sure that the cream cheese is all mixed in and there aren’t puddles of cream on the bottom. Basically, I assure you that this recipe DOES work. It does. I promise. Just like the cake roll recipe. If you’ve never made a cake roll recipe, make one. It’ll be your Christmas Miracle. A Christmas Cake Roll is the perfect holiday dessert that’s festive with holiday sprinkles, ganache, and whipped cream. Over bake the cake rather than under bake it. I know that I always preach under-baking but with a cake roll there is a sweet spot when the cake is done but not too much (or it’ll crack) and not under done (or it’ll crack). That is when the cake bounces back when you touch it. Roll it while it’s hot! Check out my cake roll tutorial as well as the rules for cake roll making. If it cracks, no problem. Glue it back together with the filling. If you’re worried about how it will look, make extra filling and frost the outside like I did my strawberry shortcake cake roll. Cake Roll Pan – 10×15 is perfect! Make this Christmas Cake Roll for the perfect holiday dessert! A yellow cake roll filled with cream cheese whipped cream then topped with chocolate ganache and sprinkles. Make the filling: place cream cheese and sugar in a large bowl or the bowl of an electric mixer. Use mixer to beat the cream cheese and sugar until it’s smooth and fluffy, then beat in vanilla. Slowly add the heavy whipping cream, then turn the mixer up to high and beat until stiff peaks form. Halfway through mixing, stop the mixer and scrape down the sides and bottom of the bowl. Stir sprinkles into the whipped cream. To fill cake: Carefully unroll the cake. Spread with the whipped cream mixture. Carefully roll the cake back up as tight as possible, unsticking it from the towel as you go. Wrap the cake roll in plastic wrap and chill until ready to top and serve. To top: place chocolate chips and heavy whipping cream in a microwave safe measuring cup or bowl. Heat on high power for 60-90 seconds or until the cream is hot, then whisk until smooth. Let cool for 10 minutes. Place cake roll on a wire rack set over a cookie sheet. Pour the ganache over the cake evenly. Top with rmore sprinkels. Chill until set. Be sure to check out all my other cake roll recipes. If you’re looking for a fabulous holiday dessert recipe you should also try my Eggnog Cake Roll or my Pumpkin Caramel Cake Roll. I’m also dying to try a Tiramisu Cake Roll. My friend Lisa’s Candy Cane Cake Roll is also perfect for Christmas, as is Leigh Anne’s Peppermint Ice Cream Cake Roll! Basic sounds great! Love this. I can’t wait to make this for the whole family! Can this finished cake be frozen? Thinking of baking, filling, and ganache then freezing to transport to holiday gathering. Is it really on 3/4 cup of flour? I’m wondering if it needs. Thank you for posting this recipe..it was delicious! For the filling i substituted the granulated sugar with icing sugar. The granulated sugar readily available in the supermarket where I live is not as fine as i like for baking (didnt have time to take a 1 hr drive to buy castor sugar at the one that does carry fine sugar!). Whipped this up in a jiffy and it was devoured by my guests in record time. Will definitely be making this again …five stars! Wow!this cake looks so yummy!? This cake was super easy to make. However, m not sure I’d make the ganach again. Next time, I’ll just frost it.